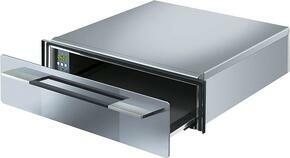 Warming drawers help keep foods and beverages at their ideal serving temperature. These built-in appliances are installed into walls and cabinetry, with doors that slide in and slide out like drawers. Warming drawers are a great companion to other built-in appliances such as wall ovens, and perfect for those who love to prepare multi-course meals. Find a size that's a seamless fit with your culinary arsenal. 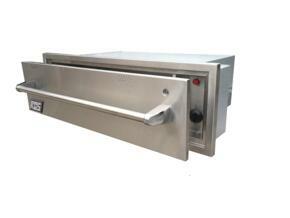 They can be as small as 24" wide with a modest 0.8 cu ft capacity, suitable for a tray of appetizers. For those that require a larger drawer, some warming drawers have up to a 4.0 cu ft capacity which can easily keep a large holiday turkey warm. Easily adjust temperatures using the digital and knob controls. Controls are hidden inside the warming drawing, adding to their sleek appearance. Many feature an indicator light to let you know when the drawer is in use. Some models are equipped with a humidity control to help retain moisture and prevent succulent roasts from over drying. A few even include a convection heating system which allows you to cook foods in low temperatures and helps keep fried chicken crispy. 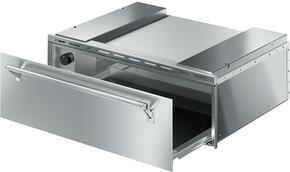 They can be installed to suit various kitchen layouts and ergonomic needs. A few are approved for outdoor use, so they can easily be added to your outdoor kitchen islands and comes in handy when throwing weekend backyard get togethers. Some meet ADA compliance standards where they can be placed within a high reach of 48" and low reach of 15" for effortless accessibility. 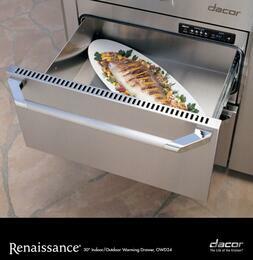 Browse the latest models from top brands including Thermador, Dacor, Miele, and more. Choose from stainless steel, black, white, blue, green, orange, purple, red, silver, slate, and yellow finishes. 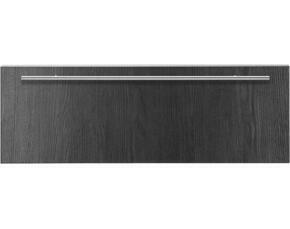 A few are available in a custom color and are panel ready to blend in with existing cabinetry.